The purpose of Computer-Based Testing (CBT) is to evaluate whether or not pharmacy students have a certain level of knowledge through an objective examination before beginning pharmacy practice. Schools of pharmacy are able to set their own examination dates within a certain timeframe. Students respond to questions which are sent over the Internet and displayed on their computer screens. The questions differ for each student. Each of all questions issued are associated with expected response rates based on previous trials, trial tests and past examinations. A mechanism is used to ensure the overall level for each student is the same even if the questions are different. By combining a total of 310 different questions, overall expected response rate is regulated systematically to the same level for all students. CBT questions are made based on the 990 items of specific behavioral objectives (SBOs) in the Model Core Curriculum for Pharmacy Education and Model Core Curriculum for Pharmacy Practice. Total of 310 questions are divided into 3 zones and issued to the student as shown in the table below. CBT questions are in a format where students choose the correct answer (or occasionally the incorrect answer) among five options. The sentence of each option is uniform and not very long so that students are able to answer each question within one minute. On the other hand, the content of each question corresponds to only one SBO. Rather than issuing the same questions to all students, different questions are randomly issued to each student. CBT questions are at a level that assesses basic knowledge on important keywords and topics covered in each area. With sufficient basic knowledge learned over the four years of undergraduate study, students are expected to score 70 to 80 %. 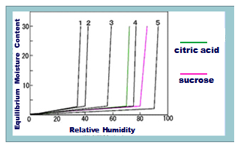 The figure demonstrates moisture equilibrium curve of citric acid and sucrose at 25 degree in Celsius individually. Which of the following best demonstrates the moisture equilibrium curve of the mixture of the citric acid and the sucrose by 1 : 1 ratio of mass? Which of the following is a structural formula of Aspirin? 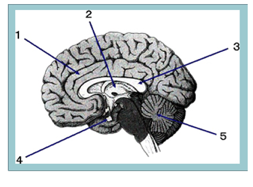 Which of the following arrows points the area of thalamus? Which of the following graphs best represents the Japanese demographic structure in 2003? Which of the following is a natural medicine arose from paeoniaceae-root and utilized as a constituent of kakkonto (葛根湯), shoseiryuto (小青竜湯), tokishakuyakusan (当帰芍薬散), saikokeishito (柴胡桂枝湯) and daisaikoto (大柴胡湯)? Copyright © 2015 PhCAT All rights reserved.